The library now subscribes to Nature online rather than in print. 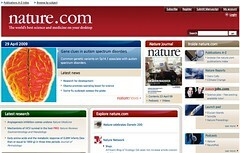 Nature.com web feeds allow you to sign-up for rss feeds that provide headlines, summaries and links for all the new content from various scholarly journals. If you would rather sign-up for email alerts instead of RSS feeds then you can sign-up for a personal account. By doing this you will also be able to save searches and schedule regular updates and email forwarding of those results by logging into your account. This entry was posted in Biology, Science, Tips. Bookmark the permalink.